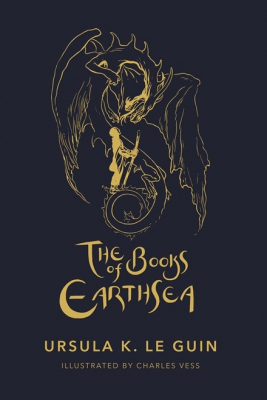 The Books Of Earthsea - ubiq bookshop: the best place to buy books! Contains the short story, "The Daughter of Odren", published in print for the first time, and her last story "Firelight". Ursula K. Le Guin's Earthsea novels are some of the most acclaimed and awarded works in literature - they have received prestigious accolades such as the National Book Award, a Newbery Honor, the Nebula Award, and many more honors, commemorating their enduring place in the hearts and minds of readers and the literary world alike. Now for the first time ever, they're all together in one volume-including the early short stories, Le Guin's "Earthsea Revisioned" Oxford lecture, and new Earthsea stories, never before printed. With a new introduction by Le Guin herself, this essential edition will also include over fifty illustrations by renowned artist Charles Vess, specially commissioned and selected by Le Guin, to bring her refined vision of Earthsea and its people to life in a totally new way. Stories include: "A Wizard of Earthsea", "The Tombs of Atuan", "The Farthest Shore", "Tehanu", "Tales From Earthsea", "The Other Wind", "The Rule of Names", "The Word of Unbinding", "The Daughter of Odren", and "Earthsea Revisioned: A Lecture at Oxford University".